A spectacular and one-of-a-kind property in the Heart of Victorian Village, a quick walk to the exciting Short North & Arena Districts! 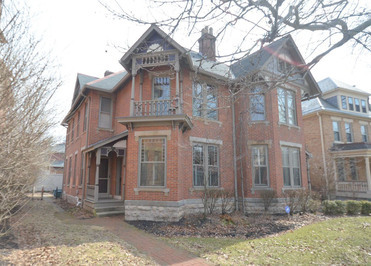 A huge, fabulously renovated Single Family that could have up to 7 Bedrooms. Or, can be used as an INCREDIBLE Owners Unit with 4 Bdrms, 2.5 Baths, all dramatically renovated living spaces, PLUS a separate Guest Suite, Mother-in-Law Suite or Rentable space with 2-3 Bdrms, 2.5 Baths. Gorgeous new hdwd flrs and loads of character w/contemporary features. Phenomenal Kit w/Granite & SS. Bonus 1st Flr Office /Den /Library. Carerra Marble Mstr Bath. 2,778 SF in Owner's Unit, 1,953 SF in separate unit that could all be combined by opening pocket doors. 2 Car Garage. High quality everything. You really have to see this one!